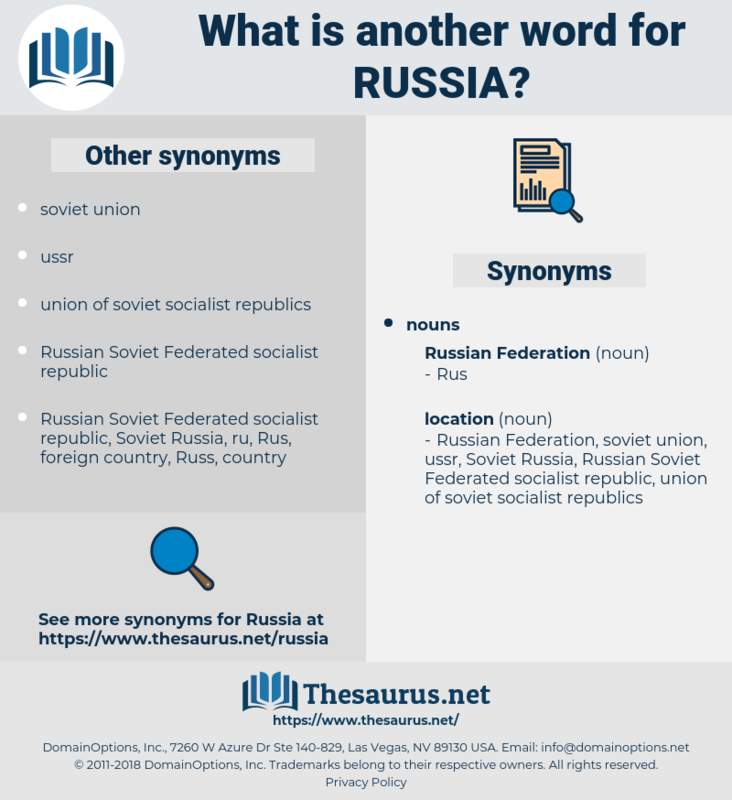 What is another word for russia? 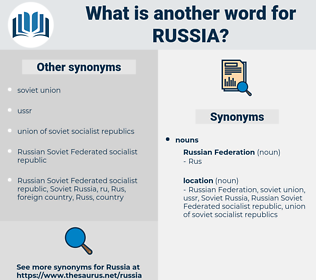 Russian Soviet Federated socialist republic. neighbours, shipowners, churches, economists, Ros, members, TASS, heads, moscow. agreed, said, reported, signed, Met. All Russia has heard of it and me. But it is a very expensive journey to Russia, and costs me every time seven marks. res, raceway, re-argue, roseau, risc, raucous, resew, ross sea, ruse, roach, rhexia, ruck, rosacea, risque, rock cake, richea, rise, rouse, reissue, razz, ruscaceae, rouge, rhus, roughish, risk, rusk, rough-house, raise, riga, rook, race, ragee, rugose, rorschach, rococo, rioja, rase, raja, Rus, raj, rachischisis, rushy, rice, row house, rash, rockchuck, roguish, rookie, ragi, ruga, roux, rucksack, rejoice, rush, rye whisky, rick, rage, rous, reseau, reggae, rework, raree-show, rajah, rachis, ricksha, rosy, rough-hew, reccy, Rya Rug, rescue, reecho, recuse, rye whiskey, recco, raze, roughage, rickshaw, reuse, ruscus, rosaceae, risky, racy, r.c., rogue, recess, reach, ruckus, recce, roc, ragusa, Reyes, rousseau, rosaceous, ras, roughhouse, rug, rehouse, ross, rockies, rig, resh, Rex, roccus, rose acacia, resize, rack, rissa, rejig, rag, rehash, reich, rask, rose, reek, riches, rush away, rickey, RG, rosa, rehearse, reassess, rocky, rhesus, rake, rag week, rakish, rough, re-echo, rock, rich, rico. eurasia, russia, commonwealth of independent states, union of soviet socialist republics, ussr, soviet union, cis. vepse, Novaya Zemlya, mordvinian, veps, Amur River, molotov, kola peninsula, Saint Petersburg, kaluga, don, mari, ilmen, vepsian, astrakhan, inger, petrograd, mansi, Heilong Jiang, Soviet Russia, neva, Russian Soviet Federated socialist republic, European Russia, siberia, ufa, Volkhov River, St. Petersburg, Nova Zembla, mordva, urals, Nizhnyi Novgorod, capital of the russian federation, Nizhni Novgorod, vogul, vetluga, Chechenia, saratov, Lake Ladoga, cherepovets, amur, omsk, Russian Capital, onega, russian, tsaritsyn, Rostov Na Donu, chelyabinsk, caspian, ingerman, soviet socialist republic, novosibirsk, novgorod, cheremis, nalchik, russia, gorky, Chechen Republic, rostov, vetluga river, dnieper, gorki, Lake Ilmen, Ural Mountains, perm, groznyy, grozny, volgograd, Khabarovsk, heilong, Chechnya, kazan, Caspian Sea, Tyan Shan, Volga River, kursk, karelia, ladoga, volkhov, smolensk, don river, Rostov On Don, Lake Onega, cheremiss, murmansk, volga, moscow, Dnieper River, muscovy, peterburg, mordvin, gorkiy, vladivostok, komi, ingrian, stalingrad, leningrad, Neva River, Tien Shan.